Use the AutoFill handle to quickly enter a series of dates, or a list will all dates the same. If a worksheet contains cells that have been left blank, you can fill in the blanks, by copying the value from the first filled cell above the blank. By filling in the blanks, you'll be able to sort or filter the list. The following technique makes it easy to fill in the blanks. In this Excel video tutorial, you can see how to use a mouse shortcut to copy cells that contain formulas, and then paste those cells as values. This will lock in the values, so you can sort or move the cells, without any problems. This technique is the quickest way that I've found to copy and paste the values. If you prefer to use keyboard shortcuts in Excel, instead of mouse shortcuts, you can find a long list of them on the Excel Keyboard Shortcuts page. This video shows how you can use a quick and easy mouse shortcut in Excel, to create a hyperlink to another cell in the workbook. When the user click on the hyperlink, they'll be automatically taken to the linked cell, without using any macros in your workbook. 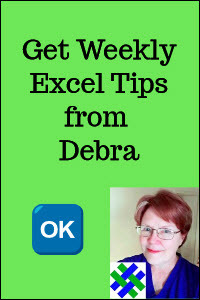 You can use this Excel hyperlink technique to create a table of contents in an Excel workbook, or to provide a quick link from one worksheet to another worksheet. That will make it easier for users to navigate through the workbooks that you create for them. In Excel 2003, you can increase or decrease all the numbers in a range by a specific amount. For example, in a price list, all the prices could be increased by $1.50, or the prices could be decreased by 5%. The technique shown in the following video makes it easy to increase the prices on the worksheet, all at once, by using the Paste Special command on the Excel menu bar. You'll type a value into a cell, then copy that cell, and apply its value to other cells. In Excel 2007, you can increase or decrease all the numbers in a range by a specific amount. For example, in a price list, all the prices could be increased by $1.50, or the prices could be decreased by 5%. The technique shown in the following video makes it easy to increase the prices on the worksheet, all at once, by using the Paste Special command on the Excel Ribbon. The technique is similar to the steps in the previous video, for Excel 2003, but the command is in a different location. You'll type a value into a cell, then copy that cell, and apply its value to other cells.